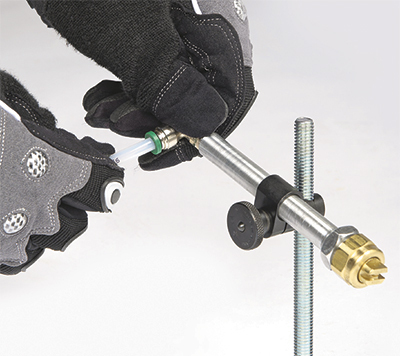 Industrial Innovations, Wyoming, MI, introduces its Z-nozzle, a zero-drip nozzle with magnetic base that secures it tightly to its mount, yet can easily be moved and repositioned as needed for various applications. The Z-nozzle is 99.5-percent drip-free, helping to eliminate costly waste in lubricant application. Designed to work with the firm’s Spra-Rite spray lubrication system, Z-drip spray nozzles combine low pressure with high velocity. Fluid application is controlled through pressure, time, degree of pattern and electronic programming of a simple HMI. The design provides easy interchangeability of the spray tips for a variety of spray angles and volumes. For example, at 40-PSI water pressure, flow is 0.1 gal./min. at a 25-deg. angle; 0.2 gal./min. at 65 deg. ; and 0.4 gal./min. at 110 deg. The spray nozzles are available in brass, stainless steel or plastic, with tubing choices of 1⁄8-, 3⁄16- and ¼-in. dia.